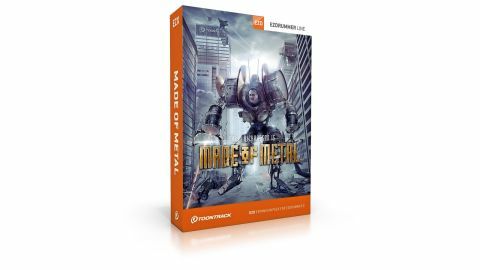 Toontrack has no shortage of metal sounds in its catalogue, each one produced by world-class people, but think of this as an extra palette. Of course you'll need EZdrummer 2 to run it, but at £50, it's almost robbery. Superb value for money. Nails a nice variety of modern metal drum sounds. Pin-sharp note definition. With the latest EZ Drummer EZX Expansion, Made Of Metal, metal production legend Colin Richardson, engineer Carl Bown and UK drum supremo Jason Bowld have bottled up a complete drum recording setup in software form, offering it to you for just under £50. "Colin Richardson? I've heard of him, haven't I?" If you're a fan of metal and have read any sleeve notes in the last 20 years, then, yes, you'll know Colin from his work with the likes of Slipknot, Machine Head, Bullet For My Valentine and loads more. "The sounds are aimed at modern metal and hard rock, and they do this brilliantly, in a number of flavours"
Now, Belgium may not be the first place you think of when it comes to the creation of groundbreaking metal drum sounds, but when Toontrack's Mattias Eklund gave Colin Richardson the green light to go anywhere in the world to record this project, Richardson chose Galaxy Studios in Mol, Belgium. Armed with an arsenal of microphones and outboard gear, Richardson, Bown and Jason Bowld set about sampling four kits (Tama Starclassic Bubinga, Mapex Velvetone, Truth Custom Walnut and DW Blue Oyster). As well as these shell packs, you get five snares (Ludwig 402 and Black Beauty, Brady Jarrah, Mapex Black Panther Seamless Steel and a Yamaha Custom Maple), plus 16 cymbal variations from Paiste, Zildjian and Sabian covering just about every sound you're likely to need. There's also a set of MIDI grooves recorded by Jason - less useful to drummers in their own tunes, but a brilliant way of checking out Jason's playing at any tempo! Toontrack's philosophy with its EZ line of products means that there's very little messing about, and this one follows suit. The kit sounds have been made into five presets: ￼one for each kit with control over the grouped microphones, overheads and ambient mics, as well as additional compression and reverb. The extra 'Original Mix' preset spreads all of the close mics for each drum across the mixer, giving you comprehensive control between, say, the top and bottom snare mic balance. The sounds are aimed at modern metal and hard rock, and they do this brilliantly, in a number of flavours. The snares - although dimensionally similar - range from rockier, fatter sounds (402, Black Panther) to more Lamb Of God/Slipknot-style cutting sounds (Yamaha and Brady), and we found that adding some ambience to the Yamaha got us very close to the Deftones' White Pony snare sound. We mentioned clarity earlier, and even with the ambient mics cranked, all of the kits here offer pin-sharp note definition. The kicks are pointy, yet full. The toms have great attack and plenty of round sustain, making each note heard, but also sound full.